Discover Special Collections & Archives! Contact us for additional information about tours, research, and donating materials to the collections. Since its inception in 1982, Special Collections & Archives has been an integral part of the Regent Community and Regent University Library. It is the home for objects relevant to Regent’s history, culture, and academic scholarship. It continues to acquire, organize and preserve a treasure trove of unique primary research materials and rare and meaningful resources for scholars and researchers on campus and around the world. 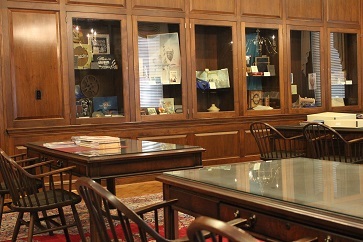 Selected materials such as important papers, artwork, books and unique ephemera are displayed in the Lehman-Kiewitt Reading Room on the second floor of the library building. The Reading Room is currently open by appointment only. Limited research services are provided to qualified scholars. Researchers should contact the Regent University Library in advance to confirm that their area of interest is available in the collections. Guided tours may also be arranged in advance. The orderly growth and development of the university Special Collections & Archives is dependent upon the interest, support and generosity of patrons and friends of the library. Gifts of appropriate materials in a variety of formats and subject areas are welcome. The accession of any gift materials is done at the discretion of Dean of the Library. Subjects of particular interest include early films, film history and research, hymnals and Psalmody, Pentecostal and Charismatic history, Christian cartooning, and Christian leadership and faith in politics. Special Collections & Archives collects, preserves, provides access to, and interprets resources relevant to Regent University history and culture along with other resources of interest to Regent University. 1) We aggressively collect and organize resources of enduring historical value pertinent to the history and culture of Regent University. These resources include paper records, university publications, correspondence, theses and dissertations, faculty publications, photographs, video and audiotapes, films and memorabilia. The Archives also consist of books, some papers and memorabilia pertaining to the ministry and political activities of Dr. M.G. "Pat" Robertson, the founder and chancellor of the University. Pentecostal/Charismatic History & Research (The Pentecostal Research Collection, The John Wimber Collection, The William Standish Reed Collection, the Rev. Dennis Bennett Papers, and the Hon-Melilli, Audio Visual Collection, The Vinson Synan Papers, The Larry Christenson Papers, and the North American Renewal Service Committee (NARSC) Papers, etc). 3) We support the University Library and University public relations outreach with Special Collections & Archives resources and services. 5) We provide research assistance to qualified scholars and others who use the Special Collections & Archives resources. 6) We apply preservation methods and procedures to preserve Special Collections & Archives resources. 7) We plan and arrange displays of Special Collections & Archives materials and other resources.